With the dust settling on another season in which they failed to get out of the EFL Championship, thoughts are turning to what Leeds United have to do next to turn the promise of the campaign just finished into real success. While fans are generally much more positive than they were at this stage last year a number of key questions need answering first before anyone can consider the Whites genuine contenders for promotion. Number one is the subject of ownership. Andrea Radrizzani looks set to complete the second 50 per cent of his takeover from Massimo Cellino and hopes to do so in the next week, but the club cannot afford the deal to drag on as they need decisive leadership from the top. With the new man in full charge the big decisions can then be made about the team and Leeds can get on with the job of putting together a squad capable to finishing higher than the seventh place just attained. The next obvious move would be to clarify the future of head coach Garry Monk, with the offer of an extended and improved contract. With Monk on board the essential planning can begin and for the first time in recent years United can have some summer stability and get in the players they need well ahead of the start of the new campaign. On the subject of players there are a number of questions thrown up with several of the 2016-17 squad on loan and returning to their parent clubs. 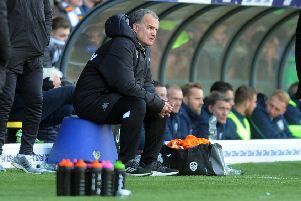 It appears Leeds do not intend to take up options to sign wingers Hadi Sacko, Alfonso Pedraza and Mo Barrow after none of them proved consistent enough in their performances in a United shirt. That will leave whoever is in charge looking for at least one wide man and already there have been links to Barnsley’s Marley Watkins, who is out of contract. Centre-back Kyle Bartley is a different proposition with Monk already declaring he would make him a permanent signing if given the opportunity. After captaining the team on a number of occasions Bartley grew into a key figure in his loan year, but he has a year left to run on his deal at Swansea so would require a substantial fee to bring him to Elland Road full-time. The Whites will also face a battle for his services with Premiership clubs having kept tabs on his displays last season. The Premier League is where Charlie Taylor looks to be heading for after his refusal to play in the last game of the season hastened the club’s desire to sell their star left-back. With Gaetano Berardi standing in so well for him and still under contract for another year there may be no need to sign a replacement for Taylor. Promising Dewsbury youngster Tyler Denton can also be called on. But there could also be more departures with the prospect of bids coming in for other prize assets, specifically Championship top scorer Chris Wood and Swedish international defender Pontus Jansson. While both have declared their intention to be at Elland Road next season big money bids may prove hard to ignore, providing another big test for Mr Radrizzani in his early days in charge.